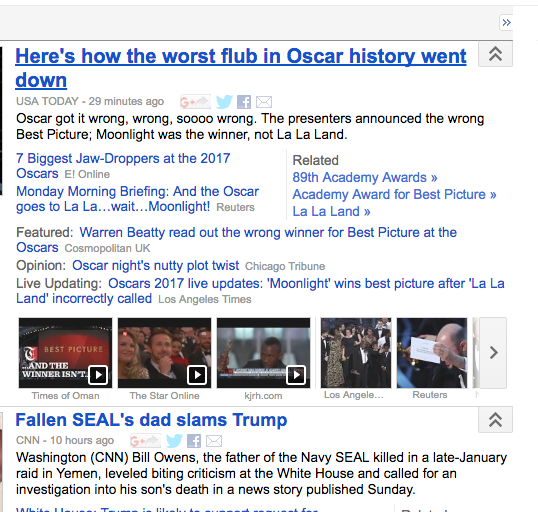 The "worst flub in Oscar History" barely edged out the return of the "let's have bereaved parents say bad things about the Commander in Chief" gambit. In BOistan, even our admittedly fake tinseltown can't get it's known to be manufactured awards show right. Somehow it seems fitting that our fake news media stacks that failure on top of the old "bereaved parents" pornographic fakery. We are primarily emotional and rational beings, not merely sexual, violent, abusive, etc. The fact that our population is not SCREAMING to shut down the daily pornographic manipulation shows that the media manipulators have been so successful, most don't even realize it is pornographic and destroying their natural desire for the proper distancing required to have a civilization. When combined with constant direct manipulation for profit and political purposes, the human capability to know what is REAL and what is fake / created / dramatic / voyeuristic is damaged to the point where the basic ability to detect "propriety / distance / wisdom / decency" is lost. Bereaved parents are bereaved. They are in great pain, they can be prompted to say lots of things. Their emotions are raw, open ... when pushed, it is possible to get nearly any angry statement you would like against ANYONE they remotely see as responsible for the death of their child from many if not most of them. As of last spring, over 2500 soldiers had died during the BO administration. Our fake media would like you to believe that NOT ONE bereaved parent could be induced to say something bad about BO by a professional fake media pornographer out of over 2500. Not ONE, and this is when the WaPo believes that the military voted 2 to 1 for Trump! When Trump got going on his "Fake News" campaign, I thought he was way out on a beach head too far. Now I am beginning to really wonder if he isn't actually at the heart of the matter. I've railed agains the level of media bias and how they use that bias to shape public opinion on daily basis way too often, but only after Trump picked up the Fake News battle did I really start to see the true scope. It took the media awhile to get the upper hand on Reagan, but they did. They had HW from the git-go, and then did all they could to cheerlead Slick Willie. W was a punching bag from day 1 and never really got his footing, and then we had the 8 years of hyperdrive cheerleading for BO. I too often forget how we are bombarded with selective tear jerking stores if bereaved military parents, families affected by immigration policy, selected sexual perversions and of course the house fire, car wreck, starving child, etc. Our humanity has been increasingly damaged by living in the largely fake, always pornographic UNreality show of the BOistan fake news machine. Perhaps it takes a "reality star" to see just how damaged we all are.